Deputy Prime Minister, Foreign and Expatriates Minister Walid al-Moallem reaffirmed on Thursday that the Syrian Arab Army didn’t and will not use any kind of chemical weapons even against the terrorists who target the Syrian people. 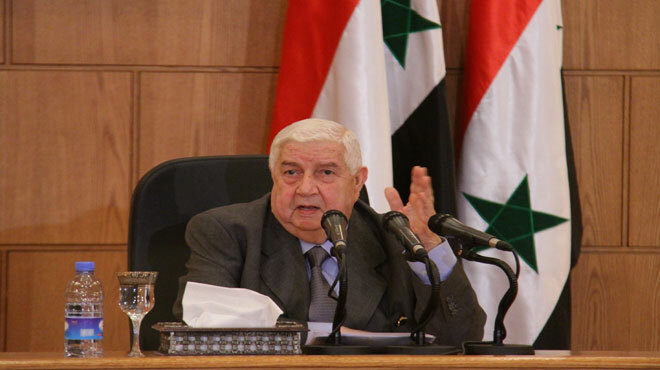 In a press conference in Damascus, al-Moallem pointed out that the lie that the Syrian army used this weapon came from countries known for always conspiring against Syria after terrorists have failed in their attacks and those countries have failed in their attempts to disrupt the political process. “All of u learned about the statement of the Command of the Army and the Armed Forces and the statement of the Foreign and Expatriates Ministry that was sent to the UN Security Council and that sent to the Organization for the Prohibition of Chemical Weapons (OPCW) and the statement of Deputy Permanent Representative in New York, and all of these statements stressed that our forces could have not used chemical weapons neither in the past nor in the present and neither could they use them in the future in any place, and we condemn such a criminal act,” al-Moallem said. 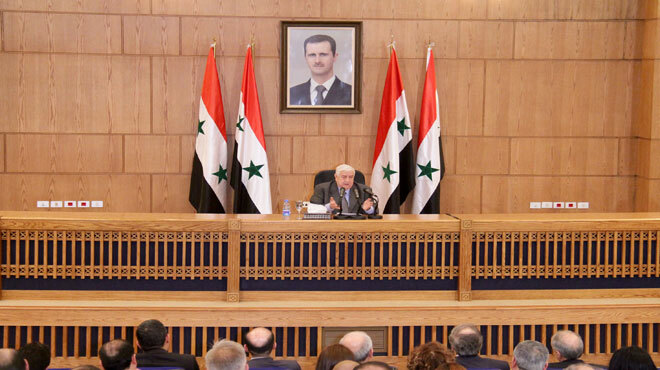 Al-Moallem reminded the press conference that Syria had already joined the OPCW and submitted successive statements on this subject and in mid-2016, the Organization confirmed the accuracy of the Syrian data provided. He however questioned the timing of this “unfair campaign” against Syria, linking it to the fact that the past few weeks have witnessed active movement toward national reconciliations, terrorist attacks in Jobar and the northern countryside of Hama to which the Syrian Army responded and succeeded to restore all points and the absence of terrorists from the latest Astana meeting upon Turkey’s request with the aim to disrupt the results at Astana. He also referred to the fact at the fifth round of Geneva, the “Riyadh delegation” had only one demand there, which is to take over power. “When all these attempts failed, they came up with the lie of the army’s using chemical weapons in Khan Sheikhoun,” said al-Moallem. He stressed that the ISIS, Jabhat al-Nusra and other terrorist groups have continued to store chemical weapons in the cities and in inhabited areas, pointing out that Syria has sent more than 100 cables to the UNSC and the OPCW that included information on the entry of chemical materials from Iraq to ISIS and Jabhat al-Nusra and from the Turkish border towards Idleb. “This choir that was launched in the international arena is made up of states that are well-known for conspiring against Syria,” said al-Moallem. 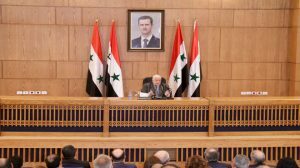 “I reiterate that the Syrian Arab Army has never used and will never use this type of weapons, not only not against our people and our children, but even not against the terrorists who are killing our people and our children and attacking civilians in the cities with their random shells,” al-Moallem added. “And we are aware that the main beneficiary of all that is happening is Israel, and it is strange to see Netanyahu almost weeping for what happened in Khan Sheikhoun,” al-Moallem said. He commented on a statement made by the US representative to the Security Council on Wednesday in which she said they do not have information one what happened in Khan Sheikhoun, yet finger is pointed at Syria. Answering a question whether Syria welcomes an international inquiry committee on the use of chemical weapons in Khan Seikhoun, al-Moallem said that on Wednesday the Russian representative to the Security Council submitted ideas on forming a neutral, non-politicized and widely-represented inquiry committee to probe into the incident, adding that Syria’s experience with such committees that have come to Damascus is not encouraging as they used to leave Damascus with certain data and at their headquarters, that data changes. He pointed out that Syria is in constant coordination with the Russian side to see where this issue will get. 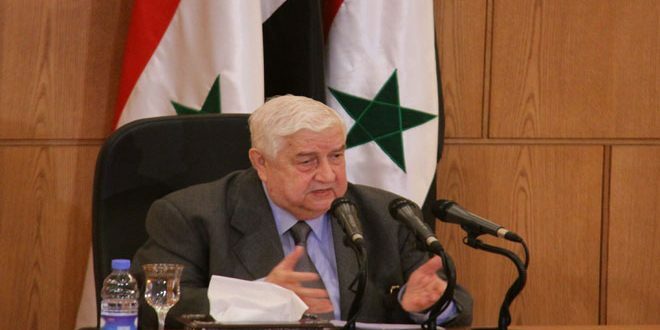 Al-Moallem noted that a new terrorist assault was launched on Thursday in the northern countryside of Lattakia as part of the continued attempts by the operators of the terrorist organizations to disturb the political operation after their recent failed attacks in Jobar and Hama countryside. The Foreign Minister cited other goals that could be behind this campaign against Syria, including to cause the US President Donald Trump to change his recent opinion on Syria, which al-Moallem said may have been slightly achieved, or to pressure the Russian side that provides real and sincere support to Syria in its struggle against terrorism, which is unlikely to be achieved especially after the two statements issued by the Kremlin two days ago on continued support to Syria’s army and legitimate government, or to pressure Damascus to change its stances and principles, which is so difficult to be achieved. Responding to a question on whether Syria accepts a UN inquiry committee, al-Moallem said Syria doesn’t accept a committee formed this way. “We have to ensure that this committee is not politicized, has a wide geographical representation and that it starts from Damascus and not from Turkey. We have many questions on this subject and when we make sure that these questions have convincing answers, then we will give you our answer,” he added. About the US military presence in Manbij and the statement of Saleh Musallam, head of Syria’s Kurdish Democratic Union party, that Raqqa may become a part of the “federal system of northern Syria” after being liberated from ISIS, the minister said that he thinks that Musallam doesn’t know anything about the population statistics and that his bravado is misplaced. “I am aware of the seriousness of the recent US statements, but there are those who said perhaps those statements were intended to practice pressure during consultations with the Russian and Chinese sides on the draft resolution submitted by the United States, Britain and France,” al-Moallem noted. He said the Syrian government and the Kurds in Syria are now fighting a common enemy, which is ISIS, adding that there is a foundation for any future dialogue with the Kurds to know each other’s requirements.